Saison Amère. Saison Station 55 is a red beer with veiled aspect, the taste of malt, hops and spices reminiscent of citrus coupled with a bitter finish. The 55 wants to be a hybrid between a Belgian beer terroir and IPA American type. It is seen against the brewing revival in Belgium. UPDATED: JUL 16, 2018 From can at Pizzeria Paradiso Dupont Circle. Clear golden with white head. Sweet, fruity aroma. Smooth saison with only a mild tartness. Can from Craft Brewed. Pours a clear gold with 2 full fingers of foam that lingers. Estery saison yeast nose with black pepper, clove and banana. Bone dry on the palate with pepper and pith. Slightly warming with quite a bitter finish for the style. 16 ounce can. Big orange pour with a lot of yeast in nose and in body. Banana and spice and nice stuff. 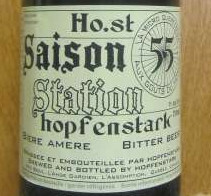 According to its description, "[Hopfenstark Saison Station 55] is seen against the brewing revival in Belgium." I would say that statement isn't exaggerated at all. This Saison drinks like the Belgian examples, and it's just as pretty and technically stunning. Effervescent clear golden yellow pour. Clove, pepper, flowers, and grass on the nose. Spicy and earthy flavor profile. Bread-like malt. It's a taste that's so cohesive that it's difficult to separate the individual parts. There's a hint of citrus. Finish is crisp, refreshing, and moderately bitter. 0.33 l can from Hoppiness, Koper, Slovenia. Shared at a drinking session with Višnja 666 and Pilot Goran in the summer of 2017. Thanks! Murky golden, creamy white head, some visible sediment. Spicy and herbal, sugary, yeasty. Very sweet, some dryness develops later on. Thick and sticky texture, medium body, moderate carbonation, sweet finish. Very sweet and sticky with a slight lack of spices or hops. Aroma is spices, mild pine and dill/cucumber. The flavor is mild cucumber, malts and a spicy hop finish. Leicht trübes Goldorange mit reichlich Schaum. Malzig, pfeffrig, hefig, leicht fruchtig, etwas Zitrus, Kräuter, bitter. Bottle sample tasted at BBF Lab Madrid 2016 on the 02/07/2016. Clear golden colour with a medium sized white head. Aroma of fruity hops, rubber and citrus. Taste is plentyof fruits, spices and hops. Aftertaste is medium sweet and dry. Next one please! 7.0 ABV. Smell of hops, yeast. Amber colour, high white head. Aroma of yeast, some weizen character, some spices, some alcohol. Flat but plentiful carbon. Slightly dry palate, half heavy body. Cloudy golden liquid with white head. Aroma of grass, slight sourness, hay. Taste of bread, copper, medium sweet, medium bitter, light sour. Medium body, thin feel, soft carb, long fin.